This is a small group show of five artists selected from the 2006 Member Show. There will be several other shows opening the same evening: the 110th Anniversary CCA Photography Retrospective and the 2007 Members Only show. Monday - Friday 8 am. to 6 pm. 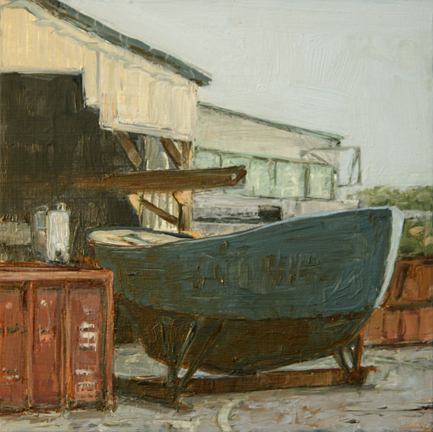 The paintings in this show are primarily from the last 5 years with mostly maritime imagery that ranges from cargo ships and oil tankers to fishing boats and industrial waterfronts. The paintings include urban night construction scenes as well. All the paintings employ a geometric system of composition and design which the Old Masters used known as Sacred Geometry or dynamic symmetry involving the ratios of the Golden Section and the root rectangles. Mark Reynolds' work is created using pure geometric grids as the artform itself, avoiding the issue of narrative content. This gallery is on the second floor of a downtown professional building with an enormous atrium that is flooded with natural light from the 6th floor skylights all day long. The building is open to the public Monday through Friday, 8 am to 6 pm and the show may be seen by appointment on the weekends. Please contact me directly by email if you would like to see the show during weekend hours. Friday - Sunday 1-5 pm. 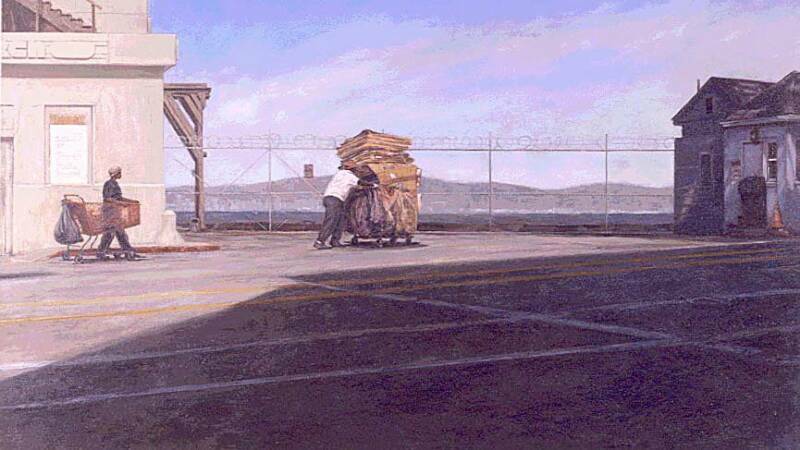 I have one urban homeless painting in this excellent group show juried by Peter Selz, UCBerkeley Professor Emeritus of Art History and the author of the recently published book "The Art of Engagement". 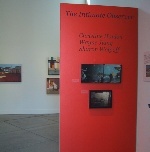 The show features a wide range of media from paintings and sculpture to ceramics and photography. The artists in the show and other information may be viewed on the website at www.sanchezartcenter.org. August 20- Sept 14, 2008 Reception: Saturday, August 23, 4-8 pm. Rasputin Records on Telegraph Ave. in Berkeley. Display of 6 large digital prints of urban homeless paintings in street windows. Artists featured were selected from Street Spirit newspaper interview articles. March 4 - 29, 2008 Reception: Tuesday, March 4, 6 - 9 pm. Gallery Hours: Wed & Thurs 11 am. - 6 pm. Friday 11 am. - 5 pm., Sat. 12 - 4 pm. February 5 to March 7, 2008 Reception: Thursday, February 7, 12:30 - 3pm. Reception: Sunday, December 9, 2 - 4 pm. November 27 to December 2, 12-5 pm. Reception: Sunday, December 2, 12-5 pm. "Import/Export #3" in the silent auction. There will be arts and crafts and holiday fare for sale. 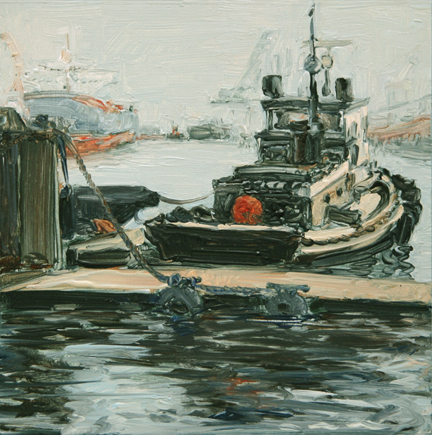 I have two paintings in this show, one maritime and the other urban homeless. This is in the Bedford Gallery at the Dean Lesher Center for the Arts, a very nice venue. Preview and early bids on silent auction items December 2-6, Actual event and festivities on Sunday, December 7, 12-5 pm. I have donated a small watercolor landscape to this fundraising event. Reception: Sunday, December 14 , 2-4 pm ,runs through January 25, 2009 I will have one painting in this show but won't be able to attend the opening. Sunday, December 14, 1-5 pm. watercolors which you can see in the Watercolors link on this site. 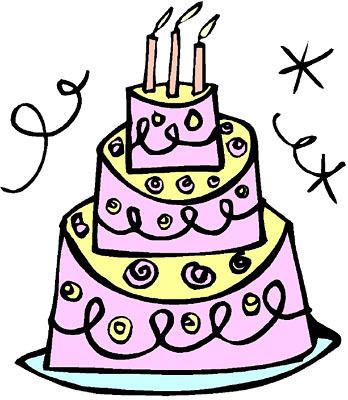 Reception: Wednesday, March 18, 12 -1 pm. with exhibit on display for the March, only until March 26, 2009. I have two mixed media figurative drawings in this group show. View online. "Hobos to Street People: Artists' Responses to Homelessness From the New Deal to the Present"
Invitational Exhibition which will travel to other museums and venues throughout California until early 2012, Currently at the California Historical Society, 678 Mission St, San Francisco. I have several large paintings in this exhibition, one of which will be on tour. Monthly events planned to educate the public around this exhibition which can be found on the website www.calhist.org. I will be on a panel discussion as one of the contemporary artists in the show on Thursday, August 6 from 6-8 pm, free to the public. Other artists discussing their work will be Jos Sances, Jesus Barraza, Doug Minkler, Art Hazelwood, curator of the exhibition will moderate. I have donated several artworks, one a small watercolor and the other a larger collage painting. Members Only, Richmond Art Center runs from April 6 through June 5, 2010 with a reception on May 1st. I have one watercolor painting in this show and will not be able to attend the opening reception on May 1, 3-5 pm. but there are 3 shows opening that day. Gallery hours Tues-Sat. 11 am -5pm. *RADIO INTERVIEW* ON LABOR DAY, September 7, 2009 1-2 pm. Women changing the world through art: Journalist Carol Harvey talks with artist Christine Hanlon about her work depicting homelessness and poverty in San Francisco; Kate Raphael speaks with Carolina de Robertis about her new novel, The Invisible Mountain, a story of three generations of Uruguayan women; Kiki Poe and Christine de la Rosa on Bliss Weekend: Oasis for Women of Color in the Desert. Plus Jovelyn's World and the women's calendar, and featuring music of Mack Mistress and Eliza Gilkison. It will be a 20 minute segment and can be found in the archives online at www.kpfa.org for a few weeks after the original airing of the show if you miss it. You can also find it here at the Women's Magazine Blogspot page. Hope you can check it out! "Hobos to Street People" exhibition at the Bakersfield Museum of Art, which opened on December 10, 2009 and is on display through February 2010. The winter exhibition at the museum includes four other shows that also focus on the theme of isolation and loss when being displaced or homeless in society, including photography, painting, sculpture and installation. The museum is located at 1930 R Street, Bakersfield, CA 93301 and the website is www.bmoa.org. Recent Show: "Figuratively", Kendrick Hall @ University of San Francisco Law School Gallery , group show at 2130 Fulton Ave, San Francisco runs from August 13 to December 18, 2010. I have 3 large urban homeless paintings in the show which will be on display for the entire fall semester during school hours. Recent Event: Coalition on Homelessness 10th Annual Art Auction to be held at SomArts Gallery, 934 Brannan St., San Francisco from 5:30-10 pm on Thursday, Sept 9th. I will be selling oil paintings, prints and watercolors which are my most recent work...please stop by and say hello! There will be over 50 other artists participating in the event. Recent Show of Hobos to Street People traveling exhibition at the Corona Public Library in Corona, CA through December 19th. On view in the Heritage Room on the second floor of the library. This is a partial display of the full exhibition due to limited gallery space, and includes my piece. Gallery hours are Tues, Thurs and Fridays 10-3pm. The show was reviewed in the Chronicle's 96 Hours on Thursday, Feb. 3. I will have one watercolor in this show. Two other shows will open that evening. 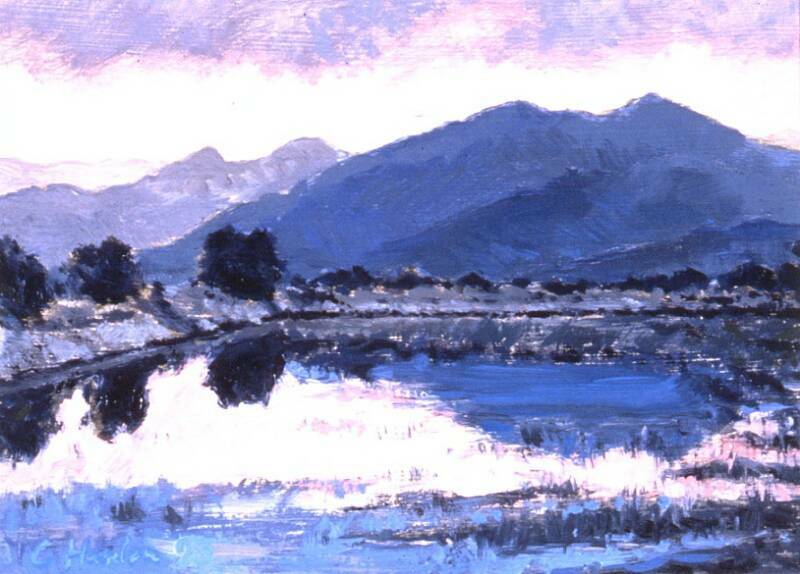 Pacifica Art Guild is the sponsor of the Elements show and it will run until March 27th. Art Auction: Saturday, April 30th 6-10 pm. 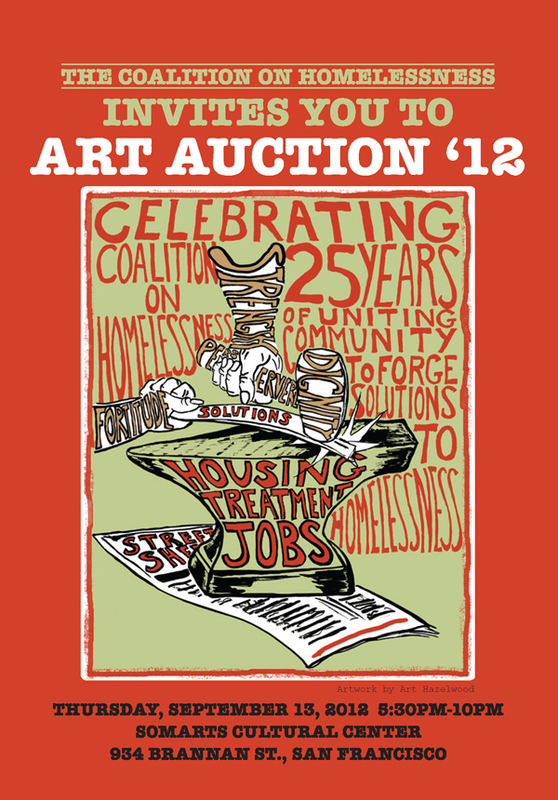 Coalition on Homelessness 12th Annual Art Auction- THIS WEEK! Thursday, September 13 5:30- 10 pm. 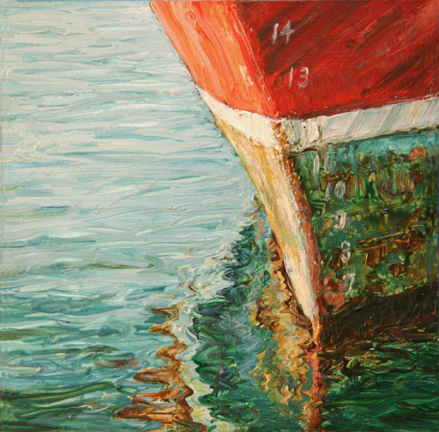 Live and silent art auction, annual fundraiser with many artists including a framed giclee of one of my maritime paintings, great food and drink, live music and lots to see...over 100 artists. I will not be there (my first year not attending) since I now live in Oregon! Please support the Coalition! To get information call 415-346-3740 or check out the details here. Buy early tickets here. 650-355-1894 There is a closing reception...check out the link for directions, gallery/office hours, etc..you can get in by arranged appointment as well by calling the office. There are 70 artists in this fantastic juried show with a wide range of art. 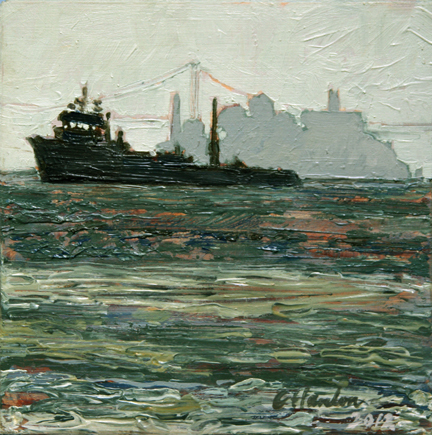 "Connections" at Gallery 13, 658 Cookman Ave, Suite 5, Asbury Park, New Jersey is a group show with fellow painter/teachers from around the US and Canada. I have 3 small pieces in this show which will be up through June 21st. Here is one which sold the night of the opening. Asbury Park is a part of the Jersey Shore less affected by Storm Sandy, but they did have damage along the boardwalk (remember the mangled ferris wheel in the ocean? that was nearby..). 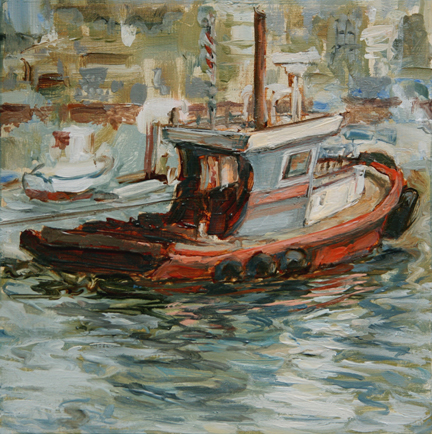 Coos Bay, OR The show will be on display from Saturday August 3rd through October 5th, 2013. 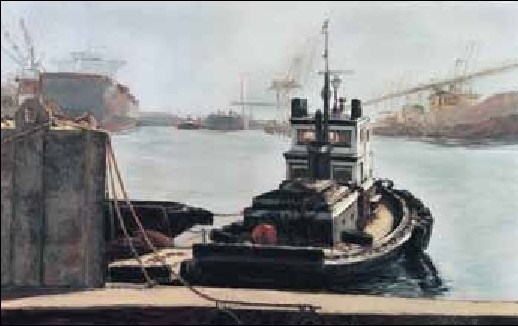 Opening Reception and Awards Dinner will be held Saturday, August 3rd from 5 to 8 pm with John Stobart (esteemed maritime artist) handing out the awards. 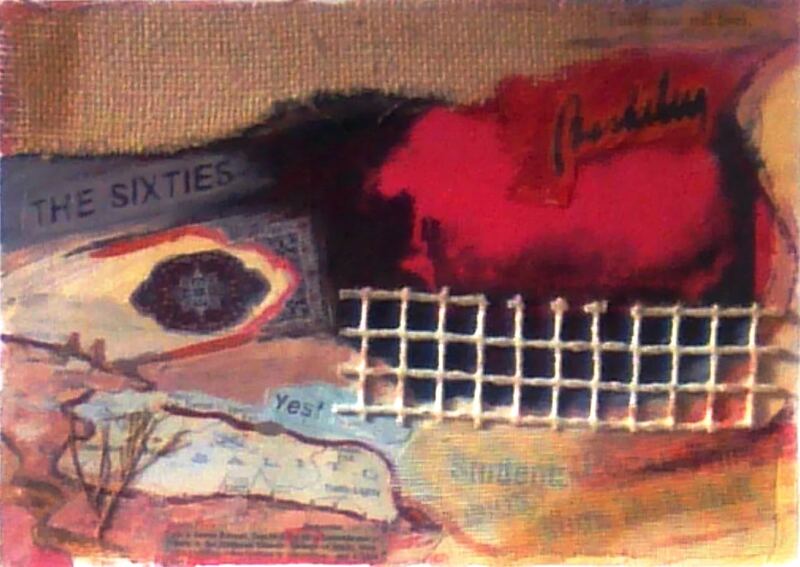 I had one painting juried into the show and am looking forward to being at the opening. Check www.coosart.org for hours. 4th Annual Miniature and Small Works Exhibition at Art by the Sea Gallery, 175 2nd Street SE , Bandon, OR. 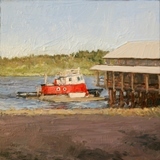 Juried by Pat Snyder, well known local artist and educator. I received a 2nd Place award for one of 3 paintings in the miniature category. The show will run through the end of July. Check www.artbytheseagalleryandstudio.com for hours. I will have two very large homeless paintings in this international group exhibition which will be catalogued and is viewable at the exhibition website here. The show will run through October 11th with a curator/gallery director talk at 4 pm prior to the opening from 5 to 8 pm on September 6th. I will not be able to attend the opening but hope you can visit the gallery. 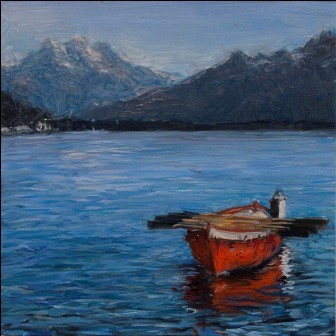 Bandon Public Library, Solo show of Oils and Watercolors in the main lobby, on display September and October with an opening reception on Thursday, September 18th from 5 to 8 pm. Come say hello! is an invitational 4 person show curated by John Wehrle, opening this Saturday, January 25th from 1 to 4 pm. There will be a walkthrough with the artists, with Q and A from 1 to 2 pm. Show runs through March 9th and gallery is open Tues - Sat. 11-5 pm. Check website for more details www.therac.org. November 19, 2015 - January 9, 2016. Happy to be in this show with a couple small oils and some excellent artists..
Coos Bay Public Library, 525 Anderson Ave, Coos Bay, Oregon. Community Art Gallery, 1992 Sherman Ave, North Bend, OR, Curator: Tracy Hodson, Group show opened in mid July and continues through December . Call for hours: 541-808-2010. Show runs May 5 - 27th, Closing Reception and gallery talk, Saturday, May 27th, 3-5 pm. I have 6 small works in this show which showcases the artists who have been published in Catamaran, the magazine, over the last year. 8th Annual Miniatures and Small Works, Art by the Sea Gallery, Bandon, OR. 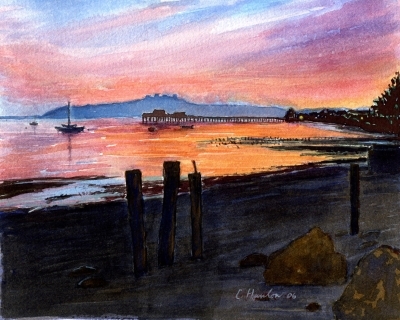 Coos Bay Library Exhibition, 525 Anderson, Coos Bay, OR, paintings on display for month of December, will be meeting and greeting the public on Saturday, December 8th from 2 to 4 pm. Stop by to see my most recent work and say hello.